I have always been fascinated by orbs ever since I got to hear about them and see them on photos. For me they are a mystery that is waiting to be uncovered, so we can get more answers about our existence. 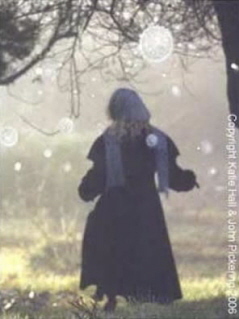 It could be my imagination, but it seems to me that we get more contact with orbs than we used to. I believe it has to do with our fast growing consciousness, which opens up our openness and willingness to acknowledge them. But why are they here and what is their message? As it happens I was in Glastonbury this summer when the Glastonbury Symposium took place. This symposium is about earth mysteries like crop circles, orbs and more. Speakers and researchers from all over the world come here to present their findings. I was especially interested in a talk by a couple who had done their own research into orbs and written a book about it, called Beyond photography. Katie Hall and John Pickering live in the Lake District; Katie is an artist and John is a designer and cartoonist. Years ago they had never even heard of orbs, so when they got to encounter them by chance, they had no idea how this would change their lives. Their house is located in woodlands and is part of a 19th century mansion. That is where they have taken most of their pictures and where it all started. Katie: “For me it started of with little twinkling lights back in 1998, in the dark time of winter and I was quite depressed. I reached out to the universe and asked for help. I asked with my heart and soul: please help to direct me, because I am lost. The help came in the form of little twinkling lights that I saw everywhere, around people’s heads and in my work. I literally thought that I had a braintumor, I got some medical advice, but everything was perfectly all right. I was asking questions to people, but no one could give me an answer and they thought I was creating this myself. Over the years I got more involved with healing and went to a seminar where I spoke to a Tai Chi practitioner and he knew exactly what I was talking about. I was advised to go with it and not to deflect it and see where it leads. Then after 4 years I finally took a photograph of the twinkling lights and made the connection to basically another life form which was interactive. We started to take hundreds of photographs because we were fascinated. After four more years, friends and relatives said that the photographs we got were so amazing that we needed to put them down in a book and so we did”. The photos in the book are definitely amazing and they do not only show orbs, but also strange light beings and even fairy like shapes. It seemed as they progressed in the years, the images would become even stranger and almost unbelievable. It was like the veils to the other dimensions were starting to open more for them and it reminded me of another book I had read, Dimensional Journey. In this book Linda Ball describes her experiences with orbs and alien beings. 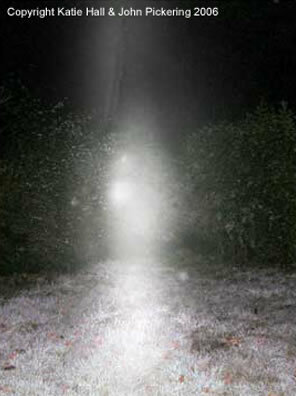 She was living on a ranch near Sedona where she had taken the most amazing photographs of orbs and alien beings. 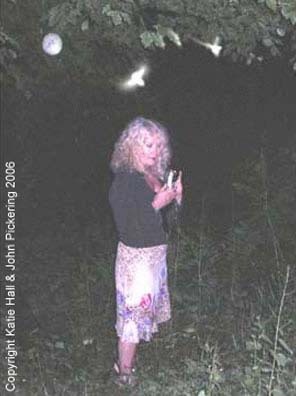 Just like Katie and John, her pictures evolved from orbs to other alien lights and even a giant being. It made me think that there had to be some sort of evolving in vibration. Maybe the contact with the orbs raised their frequency or vibration in way that other dimensions were getting to be visible and accessible. But before I get carried away, let’s go back to the beginning: what is an orb? 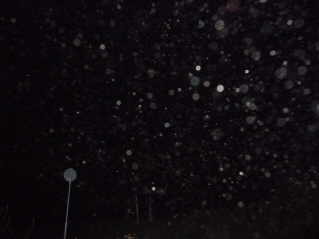 Orbs are the so called balls of light, which apparently become visible when you take a picture. Cameras are now able to pick up more of the light spectrum than we can normally see with our naked eye and that can be a reason that they show more easily on pictures. Orbs are believed by many to be life forms. There is an important spiritual significance linked to these life forms, as it is believed that many of these orbs are the spirits of our deceased and loved ones and they also represent spirits from other dimensions. 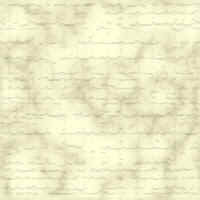 “Dust particles” is one of the most common used descriptions for orbs by non believers. Many critics and sceptics are still trying to deny the phenomena called orbs and I personally think it is because they can not really deal with the idea of “something else out there”. Too many so called coincidences and synergetic events which are experienced by people dealing with orbs are proving them wrong. One good example is the story of John and Katie’s friend Sam, who was present in a room were they took a picture, in which some orbs were visible. Not wanting to concede straight away, he said: “OK, then. But I’d be more impressed if you’d got a whole roomful.” To his amazement, they did get a picture with a room full of orbs. It was like the orbs were giving their answer. And that is exactly what they do: they communicate. Orbs have a fascinating connection with crop circles. 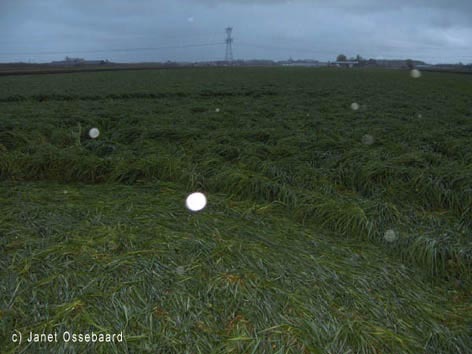 Many crop circle enthusiasts have seen orbs and sometimes captured them on film or photos while they were hanging or flying over a crop circle field. On a rare occasion orbs have been filmed while making the crop circle and you would think it is science fiction, because it does not seem real. Crop circles are becoming more creative and their shapes more complicated than ever. 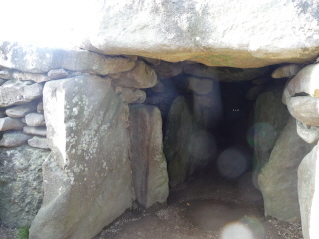 Also every year their number seems to increase, especially in the area of a place called Avebury, in the South West of England. The crop circles are beautiful and it is impossible that most of them have been made by humans, as some of these shapes would take an army to get it done. They are also usually made in the night and so it is a wonder that nobody ever gets caught in action. The night before I was going to visit my first crop circles in Wiltshire, in 2007, I had a personal encounter with an orb. I was staying in a house in Glastonbury with a group of friends and we were talking about how we thought crop circles were made and why. We discussed the theory of how orbs are responsible for making them and that they are intelligent beings who communicate. 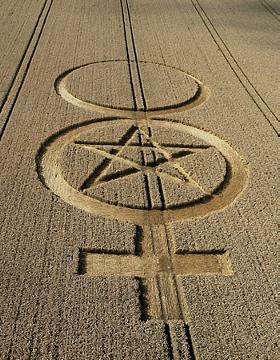 Suddenly I had an idea: I drew a picture of a pentagram on a piece of paper and showed it to my friends, claiming that this would be in the crop circle I was going to see the next day. I do not now why I did this, but I felt I needed to get my own proof on the communication with orbs. Afterwards one of my friends and I went into the garden and we stood there looking into the night. All of a sudden a ball of light went past us in the next garden, it had a tail of light and at first I was not sure if I really did see it. I looked at my friend and she said: “yes, I saw it too”. We just stood there in amazement and wonder on what we had just witnessed. The next day when we were in the car on our way to the crop circles, our driver and guide showed us a picture of the first circle we were going to see. It had a pentagram in it, together with some other symbols and again I was amazed by this synergy of events. For me there was no more doubt about the ability of orbs to communicate. Janet Ossebaard is a Dutch researcher who has done extensive work on crop circles. Her latest book is called Crop Circles, The Evidence; it is a book filled with hard facts that most crop circles are not made by people, but by an unknown intelligence wishing to communicate with humanity. She has personally witnessed crop circles being created and she has taken many photos with orbs being present at crop circles. Not only orbs have been spotted, but in most cases electric magnetic sounds have been heard while a crop circle was being created. Recently I conducted my own orb encounter experience; I had invited some friends to watch a documentary on orbs, called ‘Orbs, the veil is lifting’. This movie features two well know orb experts: Miceàl Ledwith and Klaus Heinemann, who had written a book ‘The orb Project’ in which they had published many spectacular pictures of orbs. After the movie was finished we went on an orb hunt: it was 22.30 hours in the evening and we walked to this little park in my home town of Amsterdam, where I knew a spiritual place. It is a Maria chapel, a pilgrimage place and it radiates loving energy which you can sense all around it. 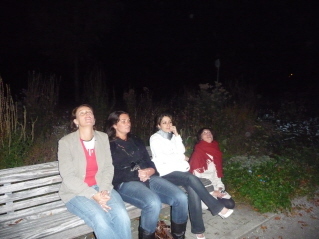 We started with a short meditation and then began to take pictures and immediately we could see orbs in the pictures. Still vague and not too many, but they were there. After about 15 minutes or so, the orbs on the pictures increased and suddenly there was this sea of orbs surrounding us and it blew us away. Then they went away again and we felt grateful that the orbs had indeed blessed us with their presence. Why do orbs appear to us, do they have a message? Katie Hall believes they are here to regain our focus on what is really important. She believes that orbs are healers, but you have to activate the contact and healing yourself. For her orbs have made a difference in her life in the sense that she has become more spiritual and is more in tune with her feelings. In the introduction of Linda Ball’s book Dimensional Journey, she writes that for her the major theme in the messages of the orbs, was that there was nothing to fear. She was being taught that she must first recognize who she truly is, who we truly are. Her experiences were very important to her growth and awareness. I believe that orbs invite each of us to start a communication that goes beyond earthly limits. It has to be initiated by ourselves and we need to open up to different realities and dimensions that are out there. Most of us live our lives in a box and forget to be in touch with our souls. The orbs help to open up more awareness about who we are and why we are here, but most important they tell us that we are not alone. The orbs show me personally that life indeed continues after we die and that helps me to grow and evolve. If you want to enrich your life with more meaning and love, get your camera out and start shooting. The orbs are waiting to hear from you.